I'm convinced that 'The Truth' comes in all guises, shapes and forms. All suited to the frame, mindset, and expectations of the receiver of that truth. In fact, it's what makes my work so interesting, challenging, and fun. Sorting through the full spectrum of hard held beliefs--and the truths that help make them so--is a fascinating, though sometimes head-scratching endeavor. Happily to say, along comes a deep and credible resource to help clear the air. DeSmogBlog, which has actually been around since '05, certainly makes my job easier with its focus on "clearing the PR pollution that clouds the science on climate change". Believe it or not, though, it's crafted by a group of communications professionals who are themselves PR practitioners. But of a decidedly enlightened sort. So, who better to provide us with a rich and revealing DeSmog "Denier Database", loads of informative links and resources, and current climate change stories and tips? 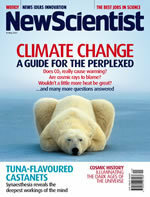 Right off, I want to thank the crew for alerting me to the issue of NewScientist (pictured right here) carrying it's useful Climate Change: Guide for the Perplexed--see it online here. I rank it up there with my previously favorited How to talk to a climate skeptic site. As always, I encourage you to visit the site and see for yourself. After all, I don't know what's going to trigger your eConsciousness--but being able to cut through the hype a bit more easily will certainly help. Here's to the truth.